High-level resource for apparel and retail professionals. Focus on market shifts, important innovations and key player moves. For brands and retailers across markets: luxury, lifestyle, general merchandise, fashion, accessories, etc. Walmart, with over 200 Bangladeshi factories producing merchandise for them, has released the results of an initial audit of 75 factories. Of the 75, 10 had outright failed. Each factory audited was given about 60 days to improve on their safety score. As a result, the retailer discontinued business with 2 factories, and reported that 34 have improved their initial grades from a C or D to A's or B's. This is a powerful indication of what can be accomplished in the country's garment industry when a retailer applies pressure. The report makes no mention of the number of factories who received an initial C or D rating and did not improve their scores. But it is a good start, 45 percent of the factories showing improvement. Much of the focus in Bangladesh, since the factory collapse and fires earlier this year, has been spit between building safety codes and treatment of workers. Earlier this month a government-appointed panel voted to raise the minimum wage to 5,300 takas a month (or about $66.24 US) from the current $38 US level. However The Ministry of Labour still needs to approve the amount to make it law. Workers have rejected the proposal indicating that nothing below 8,114 takas ($100) is acceptable. Factory owners are also fighting the wage hike, as it will increase their production costs, effectively eliminating their competitive advantage. With 100 companies now signed to the Accord on Fire and Building Safety in Bangladesh, 1500 of the 3500 active garment factories are slated to be inspected in the new year. "You can feel there is a momentum quite frankly that is quite different to what I saw six months ago, " Gilbert Hounbo, ILO deputy director-general said earlier in Geneva. In order for the Bangladesh garment industry to continue to improve its production quality, worker livelihood, and growth (although the latter has been quite strong despite the former two issues), the world's retailers will have to do their part to maintain that momentum and pressure for improvements. The retail and fashion supply chain is incredibly complex and fascinating. Sustainability issues, high volume purchasers, and fast fashion all continue to pull the various elements in different directions. Learn how it all comes together by subscribing to our courses and workshops. The Weekly is a great source of retail and fashion industry info - sign-up today. In response to the global media coverage of recent tragedies within the Dhaka garment industry, consumers and the public are demanding accountability from Western retailers for their lack of corporate social responsibility throughout their supply chain. Bangladesh, in turn, has seen a drastic shift in worker's rights overnight. The Bangladesh government amended the 2006 Labor Act, now granting the country's 4 million garment workers the right to form trade unions without approval from factory owners. The right to unionize will allow workers to voice their demands via collective bargaining tactics. The amendment also calls for the formation of a workers' welfare fund into which owners of export-oriented companies within the country will have to contribute, thus providing group insurance to workers. Wage cheating has also been addressed, and income will be deposited directly into band accounts. Further, five of Europe's largest retailers - H&M, Inditex, C&A, Primark and Tesco - have signed the five-year "Accord on Fire and Building Safety in Bangladesh". Marks & Spencer, Bennetton, and Mango followed suit, amongst others. Interestingly, there has been little activity from American retailers, aside from PVH Corp who signed the agreement last year. Wal-Mart, which is the second largest importer of Bangladeshi goods, and Gap Inc have opted out in favor of internally developed plans. Unfortunately, this implementation inconsistency could result in differing policies amongst factories within the industry. Officials in Bangladesh have formed a panel consisting of garment workers, factory owners, and government representatives to negotiate the increase of wages for factory workers within three months. Even after the historic protests to increase wages in 2010, Bangladesh currently has one of the lowest minimum wage amounts at just 3,000 takas (approximately $38.55 at current exchange) per month. Bodies of unidentified garment workers, who died in the collapse of the Rana Plaza building in Savar, lie on the ground as people gather to watch a mass burial in Dhaka May 1, 2013. Bangladesh’s low wages, and duty- and quota-free access has driven its garment export industry to a $20-billion-a-year business. The most recent factory accident in Bangladesh signals that the industry's desperation to feed the West's appetite for cheap clothes and cheaper manufacturing has gone too far. With 60 percent of exports going to Europe, there has been a shot across the bows to the European Union to implement trade actions towards Bangladesh. The hope is that new policies will pressure the Bangladeshi government into improving health and safety for the garment workers of Dhaka. Bangladesh has urged the EU not take harsh measures during this crucial economic time. Many major retailers are also feeling pressured with the surfacing scrutiny of factory working conditions. Scott Nova, the executive director of the Worker Rights Consortium, a factory-monitoring group based in Washington, notes that “the apparel brands and retailers face a greater level of reputation risk of being associated with abusive and dangerous conditions in Bangladesh than ever before.” The Walt Disney Company, for instance, has chosen to end production in Bangladesh in March after a tragic fire. “These are complicated global issues and there is no 'one size fits all' solution,” said Bob Chapek, president of Disney Consumer Products. “Disney is a publicly held company accountable to its shareholders, and after much thought and discussion we felt this was the most responsible way to manage the challenges associated with our supply chain.” This raises the question, does Disney pulling out of Bangladesh – and several other developing countries – actually help better workplace conditions? Diane Brisebois, CEO and president of the Retail Council of Canada, sees a challenge in transparency for Western agencies. A large workforce, some reported internal corruption around factory-level standards, and subcontracting all contribute to an environment in which retailers may not be fully aware of what is happening within their supply chain. Labor groups have pushed for an alternative strategies to current corporate policies in place. Independent inspectors with the authority to shut down unsafe factories as part of an agreement signed by suppliers, retailers and unions has been one suggestion. A new proposal from the ILO (International Labor Organization) is expected to be submitted to the Bangladesh Parliament in June. Less than six months after two tragic fires at apparel factories, global headlines rang out again about worker safety in Bangladesh. The illegally constructed Rana Plaza which collapsed on April 24, killing 410-500 and injuring thousands. The magnitude and proximity of recent events can spur significantly improved health and safety measures throughout the industry's supply chain. In recent decades, China has undergone a similar reformation, achieving significant growth to become the largest manufacturer, exporter and consumer of garment products in the world. 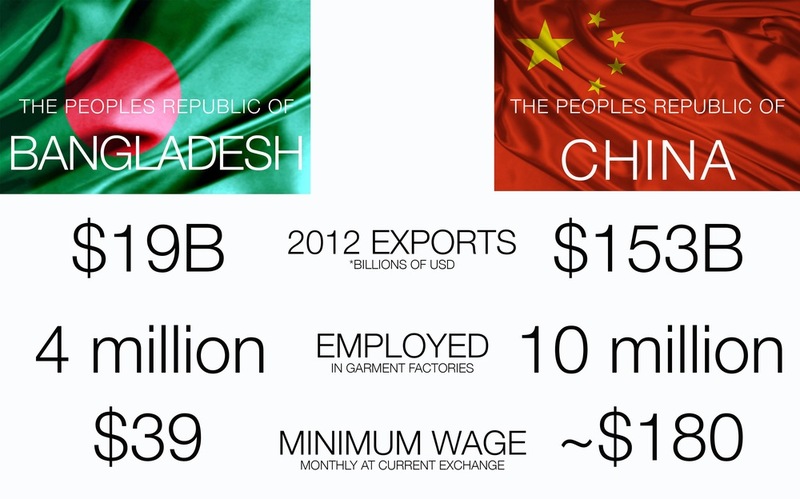 In 2012, 43.6 billion garments were made in China with an export value of $153.2 billion USD. With decades of experience in production management, economic reform,improved working conditions, and a continuous push for technical innovation, China owns the market for good reason. However, retailers looking to compete on price need lower-cost alternatives. The status of women politically, socially and economically has risen. In 2010, workers achieved a minimum wage increase of 80 percent to 3000 Takas (about $39 USD a month at today's exchange). Recent global attention and demand for better conditions and safety for workers in Dhaka. Within the supply chain, transparency is also an issue, with some retailers unaware that factories where they are placing their orders are outsourcing to factories elsewhere. A combination of cheaper labour, duty-free imports, and an emerging economy all have contributed to Bangladesh's growth. The additional applied global pressure should help raise standards for quality of their product and life for its citizens. If you'd like to learn more about supply chain in retail, subscribe to our Supply Chain Workshops. For something a little more in-depth and career specific, Sourcing and Product Management courses. The first will be in your inbox shortly. Add accounts@retailassembly.org to your contacts.